How Can I Create a Bypass While Continuing To Feed the Rest of My Conveyor Line? When vertical transfer units aren’t tied to single-function designs, the sky's the limit and possibilities of use are greatly expanded. 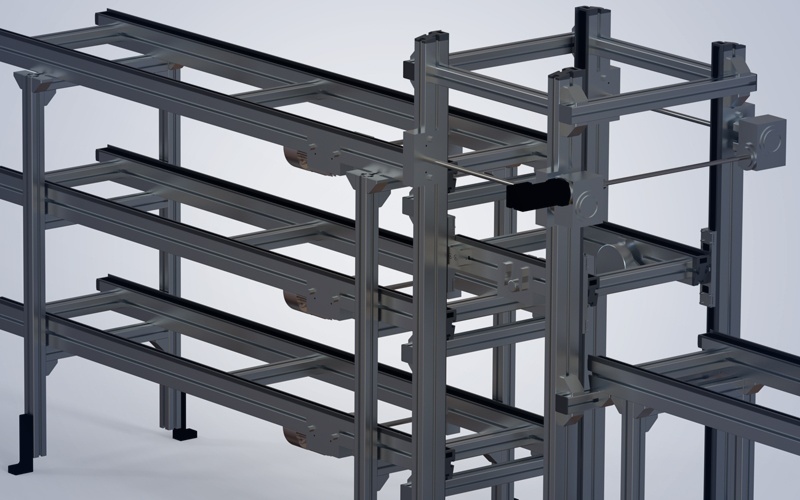 VTUs create greater access within an automated conveyor system. Instead of requiring an employee, maintenance worker, or robot to move, climb, or adjust to various points on a conveyor to perform an operation, using a lift within the conveyor line creates access to the product without loss of time. Even better, a stepper or servo-driven lift can be programmed to the exact right height for optimal working conditions – whether it’s high above the main line, access to the underside of the product, or below the main line. It enables operators or quality assurance personnel to view the top of the products if needed. Creatively applying these additional uses for a VTU creates better access to the products within your clients’ automation system. Creating a bypass on a conveyor line assists with improved throughput and efficiency in your customer’s process. A bypass lift, or conveyor pallet vertical transfer shuttle, can be used. A vertical transfer lift is similar to a double elevator, with the main benefits being increased throughput and space savings. 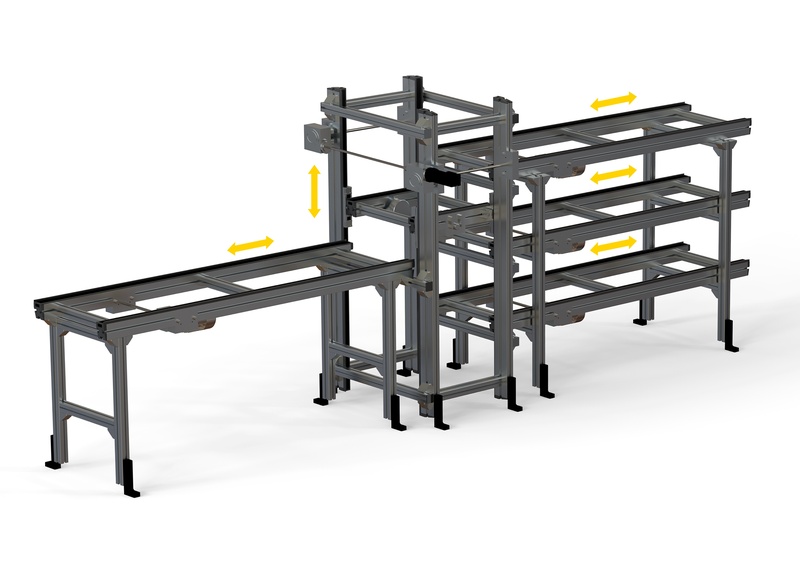 Traditionally, a parallel conveyor workstation is needed in a process automation system for an operation to be completed; using a bypass lift to vertically shift the operation to a level above the main line keeps the product flowing efficiently while not requiring additional width to be added to the conveyor system. We typically see the use of multiple bypass lifts within one conveyor to perform the operation on multiple pallets throughout the conveyor. 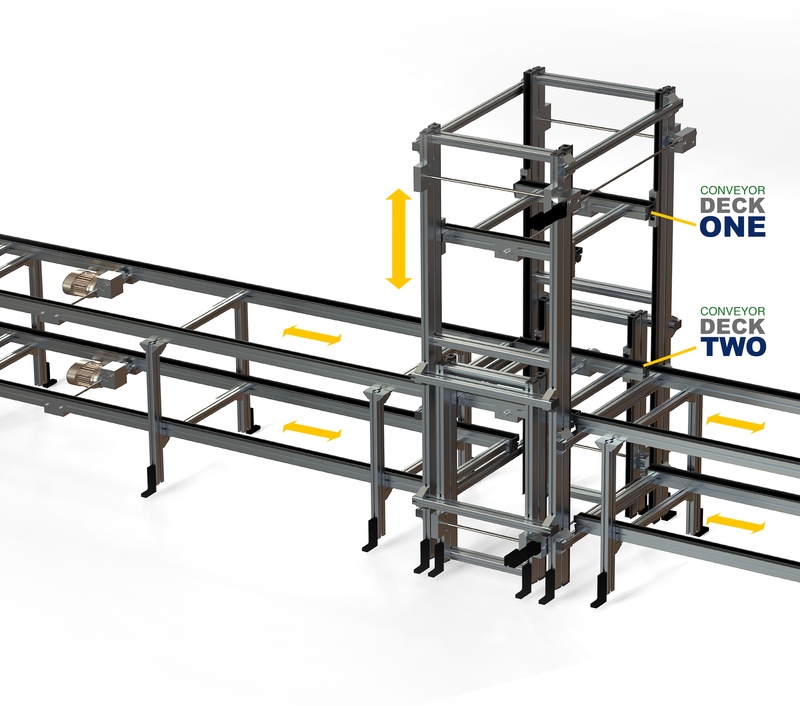 The example below describes how a multiple deck lift in conjunction with a bypass lift were used to combine process steps and save space while increasing throughput, and delivering a more efficient automation process for the client. Our integrator client was working with a large coffee manufacturer on an automated conveyor system solution for single-use brewing pods used for coffee, tea, and hot chocolate. Their process required six filling stations along one main line. Traditionally, this would have required a line wide enough to accommodate six offline workstation filling stations along the line. The line would have been at least three times as wide as the main line to make room for the added conveyor, the filling station equipment, and the product used to fill the pods. This was simply unworkable in the manufacturer’s space. The solution? A multi-tasking approach with a Glide-Line vertical transport unit using a multiple deck lift. Our engineers worked with the integrator’s design engineer to create an automation system combining multiple functions of a traditional system into one single, skinny, tall line – and accomplished the same task with greater efficiency. We added multiple VTUs within the system to lift empty trays at multiple points to filling stations above the main line. While an empty tray was rising to be filled, fifteen other empty trays were able move underneath to another elevator to be lifted up farther down the line. This process produced high throughput using all vertical filling stations along one massive line that housed six decks – essentially, six lines – and eliminating the need for bypass solutions. The creative use of vertical transport units improved efficiency and saved space, turning what would have been a complex process into a smooth, easy, and deceptively simple process. Learn about other innovations for VTUs in our guide, Innovative Ways to Create Customized Lifts and Vertical Conveyors. Download it today.